The power of a 450! The handling of a 250! With peak power of more than 45 hp, the KTM 350 XCF-W is easily the best of the class. Ultra-compact, with 57.5 mm (2.264 in) stroke and 88 mm (3.46 in) bore, and equipped with state-of-the-art electronic fuel injection, the engine offers a broad usable rev range. This delivers extremely efficient rideability and easily controllable traction on all terrain. 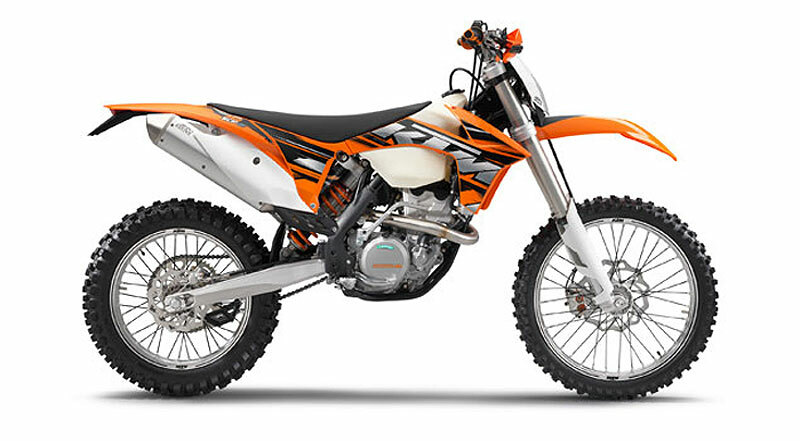 The dimensions and weight of the KTM 350cc engine are virtually the same as the 250! Its superlative performance results from reducing the moving masses to a minimum. The powerful punch from the bottom end up to the rev limiter brings a tear to the eye of every enduro enthusiast – no matter whether they’re a pro or a beginner! Alongside the very small, lightweight (only 8 mm (0.31 in)) cam followers with DLC (diamond-like carbon) coating, the DOHC cylinder head is equipped with four ultra-light titanium valves, allowing very high engine speeds of up to 12,000 rpm. Compared with the SX-F power unit, the camshafts are designed less for maximum power and more enduro-specific for a broad usable rev range. The EMS from Keihin is state-of-the-art. Along with electronic fuel injection and a 42 mm (1.65 in) throttle body, it delivers spontaneous, powerful responsiveness and handling. Automatic temperature and altitude compensation are also to be found on board. Slimmed down: Die-cast instead of sand-cast engine case! This noticeably reduces wall thickness with no reduction in stability. A lighter engine provides better handling. A special, high-strength aluminum alloy provides maximum resistance to damage. The 2013 350 XCF-W’s lightweight frame made from high-quality chromoly steel is distinguished by an extremely high level of lateral stiffness. It is also excellent at absorbing jolts introduced by the suspension system, whereby the playful handling and comfort of the KTM 350 XCF-W have been further optimized. The new DDS clutch (Damped Diaphragm Steel): The one-piece outer clutch hub with primary gear is machined from a single piece of high-strength steel. Unbeatable reliability is the result. It also allows the use of thin steel discs. This results in an extremely compact construction for a narrow engine width. A diaphragm spring enables the implementation of an additional hub damping mechanism – an invaluable benefit in terms of traction and gearbox durability. In conjunction with the diaphragm spring, the hydraulic clutch actuation system from Brembo ensures very smooth and very precise clutch control. Flexibility foremost: 48 mm (1.89 in) open-cartridge fork with fully adjustable spring preload, rebound and compression damping. Each model is individually tuned. Newly developed high-performance fork oil and new seal rings provide improved responsiveness with more constant damping properties. High quality, CNC-machined hubs are standard on all KTM wheels. The now black coated spokes increase corrosion resistance and centre the new, extremely stable, 7050 aluminum rims from GIANT. Dunlop GEOMAX MX51 tires provide excellent traction, very precise directional control and a long service life. 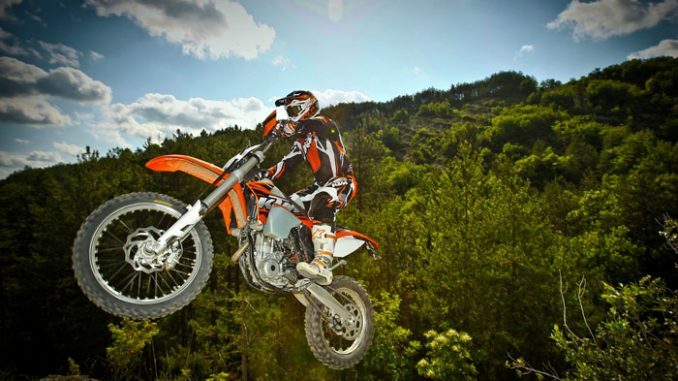 The 2013 KTM 350 XCF-W has bodywork with extremely slim ergonomics and excellent contact points between rider and machine. It provides unlimited freedom of movement. Newly styled graphics give the models a fresher appearance. Tapered, extremely stable aluminum handlebars from Neken are standard equipment on the 2013 enduro bikes. 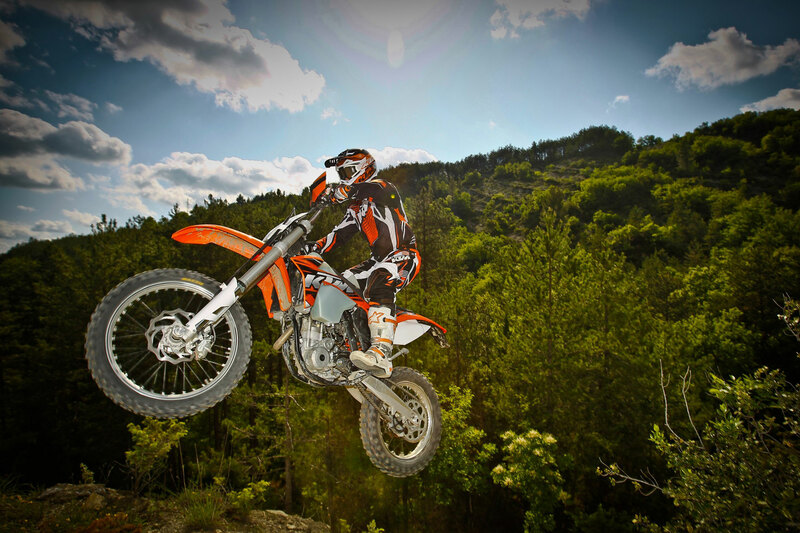 For the 2013 model year, new 2-component grips with KTM logo deliver excellent feeling and improved grip.